Release Date: ‘6th’ April 2018. Ever since the late sixties, Düsseldorf has always had a vibrant music and art scene, and that was the still the case in 2006 when Berlin born DJ Sebastian Lee Philipp first met Ralf Beck a local musician and producer in Salon des Amateurs, which had long been a favourite meeting place for artists and experimental musicians. Sebastian Lee Philipp had just arrived in Düsseldorf from London, where he had spent the last five years DJ-ing and running his own club night Caligula.That was in the past, and Sebastian Lee Philip was looking to the future when he first met Ralf Beck in Salon des Amateurs. It turned out that Sebastian Lee Philip had much in common with Ralph Beck, who was born in Düsseldorf and was now a familiar face in the city’s thriving music scene. Ralph Beck was a musician, songwriter and producer who also collected vintage synths and effect pedals. By 2006, Ralph Beck had nearly twenty years of experience and been working in studios in Düsseldorf since he released his debut album Jahr Für Jahr in 1987. Since then, he had been involved in various projects including Acapulco Highway Hi-Fi, Fortunato and Montresor, Push The Music, Sha-Ly, Yellow Cab, X-Tra Voice, Unit 4 and Nalin and Kane. This was a very different background to Sebastian Lee Philip. When Sebastian Lee Philip arrived in Düsseldorf, he was already an experienced DJ, but lacked the experience that Ralph Beck had. However, Sebastian Lee Philip was keen to learn and forge a musical career in Düsseldorf. Ralph Beck agreed to help him and this was the start of not just a new friendship, but later, a musical partnership. Just two years after Ralph Beck and Sebastian Lee Philip first met in Salon des Amateurs, they had already formed their first musical vehicle Der Räuber Und Der Prinz who released their debut 12” single Der Elektrische Reiter in 2008. Two years later, and Der Räuber Und Der Prinz returned with their sophomore 12” single Jagd Auf Den Hirsch in 2010. This was the final release from Ralph Beck and Sebastian Lee Philip as Der Räuber Und Der Prinz. Five years later, and Ralph Beck and Sebastian Lee Philip were back with a new project, Die Wilde Jagd who released their eponymous debut album to critical acclaim in January 2015. This many critics thought would be the first of many albums from the pair. Not long after the release of the critically acclaimed Die Wilde Jagd, Ralph Beck decided to excuse himself from: “daily business,” which must have come as a surprise to Sebastian Lee Philip, and been a huge blow. However, it turned out that although Ralph Beck was no longer going to be a full-time member of Die Wilde Jagd, he would co-produce and mix Die Wilde Jagd’s sophomore album Uhrwald Orange, which will be released on Bureau B on the ‘6th’ April 2018. However, Uhrwald Orange is no ordinary album. The Uhrwald which translates as Clockwood in English, is a place of dreams and sounds that has its own sense of time. It’s also a place that Sebastian Lee Philipp has spent much time thinking about, and some might even say obsessing about. More recently, The Uhrwald became part of the Die Wilde Jagd story when the time came for the band to record their much-anticipated sophomore album Uhrwald Orange. It was the most ambitious album of Sebastian Lee Philipp’s career, and on that had been inspired by art and music. This included Flemish artist Frans Snyder’s painting Animals Of The Night which influenced Uhrwald Orange, which is rich in imagery. Another influence was the ‘14th’ Century collection of songs Llibre Vermell de Montserrat which also influences and inspired as he began work on Uhrwald Orange. Recording took place at Ralf Beck’s recording studio which was where the musician and producer kept his impressive array of vintage analogue synths and effects including compressors, pre-amps and the EMT Plate reverb. All this, Sebastian Lee Philipp would put to good use as he attempted to recreate the images and music he had been imagining over the last few weeks and months. When work began on Uhrwald Orange, Sebastian Lee Philipp was determined decided to transfer his sonic interpretations of his world of images onto tape. This he knew would take time and night after night, week after week, Sebastian Lee Philipp embarked upon a nocturnal voyage into the subconscious as descended into a strange and surreal world past the boughs and branches into the symbolic forest, to Fremde Welt where the ghostly creatures reside. This includes the Acid horses, bat boys, 2000 elephants on Säuregäule, Flederboy and 2000 Elefanten respectively. To bring all this to life, Sebastian Lee Philipp made good use of the equipment within Ralf Beck’s recording studio. This also includes an array of repetitive electronic sequences that included everything from fuzzy psychedelic guitars and basses to Georgian choirs, Mediterranean mandolins and rattling North African krakebs. They play their part what’s a magical musical mystery tour that incorporates elements of medieval church music which is combined with European folklore, improvised jams, the sound of dark Nordic woods and the Eastern dawn. During the course of just eight captivating tracks written and recorded by Sebastian Lee Philipp, Die Wilde Jagd journey from the Orient to Occident. Eventually, with the five instrumentals on Uhrwald Orange were complete and Sebastian Lee Philipp having added lyrics to the other three tracks Die Wilde Jagd’s much-anticipated sophomore album was complete. It was the first album since Ralf Beck ceased to become a full-time member of the band. However, he had played a part in the making of Uhrwald Orange. Although Sebastian Lee Philipp had written and recorded and Uhrwald Orange, he had co-produced and mixed the album with Ralf Beck. When it came to the final mix-down process Australian producer Kris Baha was brought onboard and soon, Uhrwald Orange was ready for release. After just over three long years, Die Wilde Jagd which is now a vehicle for Sebastian Lee Philipp is back with their most ambitious album Uhrwald Orange. It features eight carefully crafted, cinematic tracks that are rich in imagery, as Die Wilde Jagd take the listener on a musical journey on Uhrwald Orange which features an eclectic selection of soundscapes. During the cinematic soundscapes on Uhrwald Orange, the listener’s imagination runs riot and they think of barren poppy fields and gorse valleys as itinerant, nomadic people roam from place to place seeking meaning in their empty lives. Other times, Die Wilde Jagd’s music is liturgical and spiritual as the music paints vibrant pictures of subjects as diverse as the rapture and reincarnation. Still, though, Die Wilde Jagd aren’t finished and pay homage to womanhood as they continue to create multilayered cinematic music that veers between dramatic to romantic to wistful, rueful and melancholy to ecstatic and ecstatic on Uhrwald Orange. Flederboy which opens Uhrwald Orange with a myriad of beeps that tap out a code becomes eerie, otherworldly and mesmeric as Die Wilde Jagd toy with the listener. The same motif is repeated and soon becomes part of irresistible mid-tempo instrumental earworm that is an anthem-in-waiting. Eerie and haunting describes the introduction to 2000 Elefanten which is a realistic portrayal of a nocturnal voyage into Sebastian Lee Philipp’s subconscious as he descends into a strange and surreal world that is populated by ghostly creatures. Soon, an array of instruments, samples and field recordings are combined with the vocal as effects are deployed in this journey to an Eastern land. Sometimes, it’s something as simple as a filter or reverb which adds a lysergic sound to this melodic genre-melting soundscape. It’s rich in imagery and constantly changes, veering between melodic to dark, dramatic and otherworldly as spring Die Wilde Jagd surprises aplenty. Straight away, Fremde Welt sounds dark, dramatic and eerie as Die Wilde Jagd take the listener somewhere they may be reluctant to go. No wonder, as the music is moody, broody and full of drama and tension. Suddenly the listener is thinking of places and things that once frightened them as a bass synth pounds and grinding, whining sounds emerge from the soundscape. By then, their heart will beat that bit quicker. Later, sci-fi synths lighten the atmosphere, but still Fremde Welt is a place where nobody would dare to visit. However, Fremde Welt cinematic music at its best, and the perfect soundtrack to the listener’s worst nightmare. Kreuzgang is nearly seventeen minutes long and Die Wilde Jagd deploy an array of instruments, samples and effects including reverb and filters as the soundscape ebbs and flows with changes in tempo, style and mood as surprises are sprung. Initially, guitars jangle before sci-fi synths, crisp beats and later a scampering and broody bass enters. Meanwhile, reverb is added to the soundscape, as instruments and samples appear and disappear. Soon, the soundscape slows and become moody as the tension and drama builds as a synth buzzes, drums crack and is joined by a mesmeric bass. Midway through the soundscape, it’s stripped bare before elements of medieval and ethnic music are combined during this captivating epic cinematic track. The sound of footsteps can be heard as Ginsterblut unfold and adds to this dark, dramatic soundscape where tension is omnipresent. Especially as a drum beats, while drones, a jangling guitar, ghostly harmonies and later a meandering bass, tinkling piano and percussion. They provide a backdrop for Sebastian Lee Philip’s slow, deliberate vocal which adds to the sense of melancholia. Later, when the vocal drops out a searing rocky guitar makes an appearance on this atmospheric, moody and otherworldly soundscape. Understated describes Säuregäule before an urgent, pulsating bass synth soars above the arrangement and is joined by an array of hypnotic sci-fi sounds and vocoder vocal. Together they play their part in a hypnotic and futuristic sounding track that is rich in imagery. As Der Uhrwald which closes Uhrwald Orange opens, the various sounds set the listener’s imagination racing. Soon, though, it’s all change as synths that draw inspiration from the Düsseldorf and Berlin Schools take centre-stage. Sometimes, they’re reminiscent of classic Kraftwerk, as the music becomes mesmeric. Later, it’s all change and a plucked bass is joined by a haunting soliloquy before the rippling synths return. Latterly, drums are added and crack as reverb is added to the arrangement which is soon stripped bare and Die Wilde Jagd’s sophomore album ends on a resounding high. After over three years away, Die Wilde Jagd will return on the ‘6th’ April 2018 with their much-anticipated sophomore album Uhrwald Orange which will be released by Bureau B. Uhrwald Orange is the most important album of Die Wilde Jagd’s career as it’s the first album to feature the new lineup of the band. No longer is Die Wilde Jagd a duo featuring the experienced musician, songwriter and producer Ralf Beck and Sebastian Lee Philipp. Instead, Die Wilde Jagd features just Sebastian Lee Philipp the former DJ who is now a stalwart of German music scene, who wrote, recorded and co-produced Uhrwald Orange with Ralf Beck. Mostly, though, Uhrwald Orange is the work of Sebastian Lee Philipp who combines Neo-Krautrock with synth pop and elements of avant-garde, electronica, experimental, psychedelia and rock to create a captivating and carefully crafted album. For many bands losing a musician with the talent and experience that Ralf Beck has could’ve spelt the end of Die Wilde Jagd. Thankfully that wasn’t the case and former DJ Sebastian Lee Philipp stepped up to the plate and created a truly ambitious and innovative genre-melting album Uhrwald Orange which marks the start of a new chapter in the Die Wilde Jagd story. 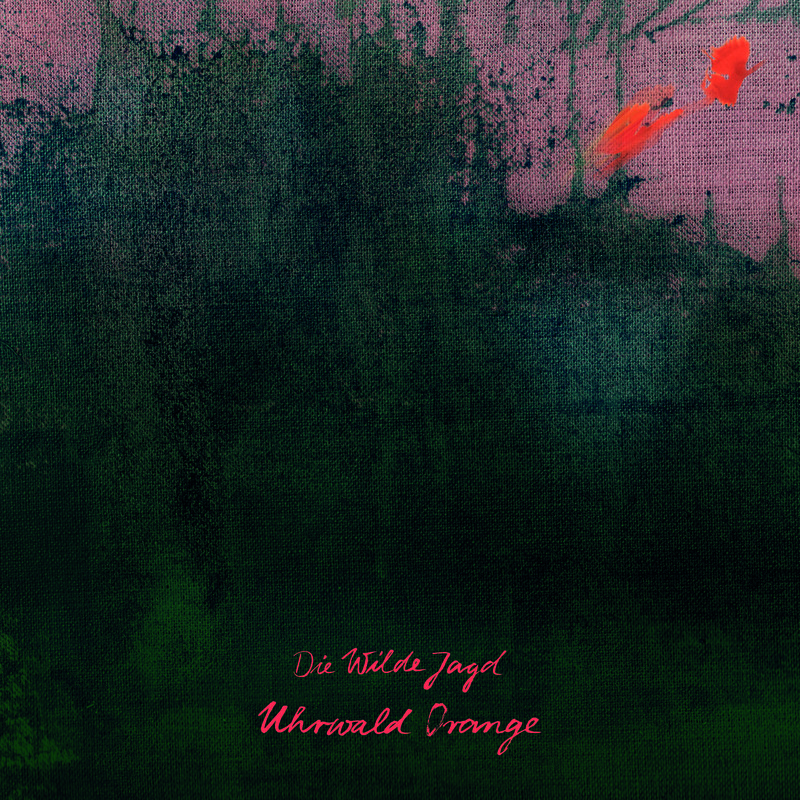 Uhrwald Orange which was masterminded by Sebastian Lee Philipp who comes of age on Die Wilde Jagd, is an album that is atmospheric, dramatic, romantic, melancholy, spine-tingling and uplifting, and is also cinematic and rich in imagery.